Area: 40493 sq km.<br><b>Location:</b> The Selkirks are nestled between the Purcell Mountains on the east and the Monashee Mountains on the west. The eastern boundary is the Kootenai River (in the US), Kootenay Lake, Duncan River, Beaver River, and Columbia Reach on Kinbasket Lake. The western boundary is formed by Arrow Lake and the north flowing Columbia River, as well as a section of the Spokane River and, on the far SE, Lake Pend Oreille. <b>Terrain:</b> The geology of the Selkirks is quite different from the Rockies and from the Purcells and other ranges to the West. Some of the rocks are the oldest outside the Pre-Cambrian shield dating about 600 million years. Before the Rockies were thrust up by continental drift, the Selkirks stood alone as an island of mountains bordering the Pacific Coast with an inland sea separating them from the Shield. The largest peak is Sir Sandford rising to a height of 11580 feet, north of Rogers Pass. The major sub-ranges of the Selkirks are the Big Bend Ranges (north of the Trans-Canada Highway), the Duncan Ranges (between the Trans-Canada and Highway 31, the Slocan Ranges (between Hwy 31 and the Kootenay River, and the Valhalla ranges, west of the Slocan River. 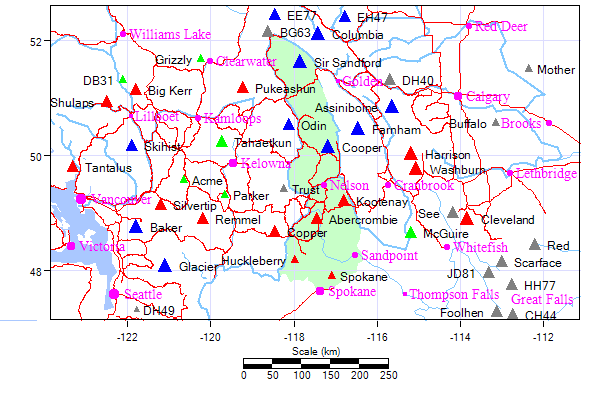 Two smaller ranges, the Bonnington Range and the Nelson Range, are the southernmost in Canada, between the Kootenay River and the U.S./Can border. The mountains generally get smaller south of the Duncan Ranges. <b>History:</b> The Selkirks were first identified as a separate range of mountains from the Rockies by David Thompson, of the Northwest Company of fur traders in 1807. At this time they were named "Nelsons Mountains". When the Northwest Company was merged with the Hudson's Bay Company, the mountains were given their present name of the "Selkirks", after Thomas Douglas of the Hudson's Bay Company, and the fifth Earl of Selkirk. It was the Selkirks, and not the Rockies that formed the most formidible barrier to the Canadian Pacific Railway, and the confederation of Canada. In David Thompson's day, the only way to get through the Selkirks was to follow the river valleys such as the Columbia which skirted around the edge. The thing that made the Railway possible was the discovery of Rogers Pass. Initially the railway ran over the top of both Rogers Pass in the Selkirks, and the Kicking Horse Pass in the Rockies but within the first 40 years were made less severe with tunnels: the Connaught tunnel under Rogers Pass and the Spiral Tunnels to reduce the 7% grade on the "big hill" up from Field to the Kicking Horse Pass. Rogers Pass was initially the hub of mountaineering in Canada, with the CPR providing guides and hotels from the pass. The railway through Rogers Pass continued to be plagued by snowslides, and was eventually abandoned in favor of the Connaught Tunnel under the pass. From then until the Trans Canada highway was completed in the early 1960's, Rogers Pass was deserted, as the road went north around the "big bend" at Mica Creek. Due to tremendous snowfalls, full time avalanche crews now bombard the slopes regularly above the pass in winter to bring down the snow. It is not uncommon for the trans-Canada highway to be closed for 12 or 24 hour periods.